Parafin is delighted to announce the first ever exhibition devoted to Nancy Holt’s ‘Locator’ sculptures. This seminal body of work, which Holt inaugurated in the early 1970s, has been very rarely seen. Nonetheless, within her oeuvre the ‘Locators’ are crucially important. The innovations and experimentation that they embody lead directly to Holt’s iconic Land Art work, Sun Tunnels (1973-76) and inform many of her groundbreaking public commissions of the 1980s and 90s. The exhibition was conceived in discussion with the artist before her death in 2014. It will include a selected group of ‘Locators’ alongside preparatory drawings and related photographic pieces, including some works which have never been exhibited. As such it will shed new light on a little-known but important body of work. For Holt the ‘Locators’ were breakthrough sculptures. They were the first works in which she physically directed and defined the viewer’s gaze thereby objectifying the process of looking, a process she would return to again and again throughout her career, particularly in her large-scale outdoor sculptures. The ‘Locators’ are simple metal sculptures fabricated in steel. Each ‘Locator’ consists of one or more vertical pipes supporting a horizontal pipe through which the viewer is invited to look. Sometimes the view through the pipe is perfectly aligned with a ‘loci’, an object in the space or a shape painted on the wall. On other occasions the viewer’s gaze is directed at a mirror to give the experience of ‘seeing oneself seeing’. 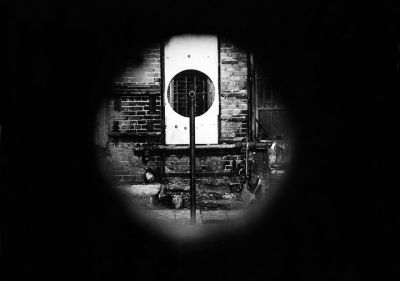 Often conceived as site-specific pieces, responding to the particularities of a given exhibition space or landscape, the ‘Locators’ frequently directed the viewer’s gaze at phenomena which might otherwise be overlooked, such as a architectural detail seen through a window. A number were conceived for gallery spaces and it is this group that Parafin’s exhibition will focus on. These first experiments with directed vision went on to inform Holt’s important early film and video works including Going Around in Circles (1973), Zeroing In (1973) and Points of View(1974) as well as major installations such as Holes of Light (1973), recently shown at the Hayward Gallery, London. Ultimately the ‘Locators’ can be seen as indexical works for Holt’s practice, making it all the more surprising that they have not been seen for so many years. Parafin represents the Estate of Nancy Holt and the exhibition has been organised in close collaboration with the Holt/Smithson Foundation, New Mexico. sculpture, Four locators: 152.4 x 30.5 x 5.1cm each. video, sculpture, Four locators: 152.4 x 30.5 x 5.1cm each.